Log in to your Office@Hand online account as an Administrator. Under Admin Portal, go to Users, and then click User list. Under Users With Extensions, click on the name of the User you want to make changes on. 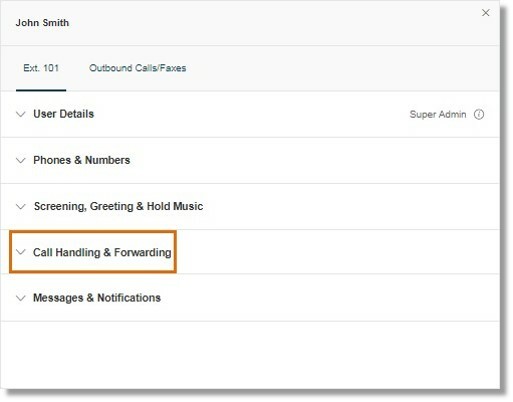 Click Call Handling & Forwarding. 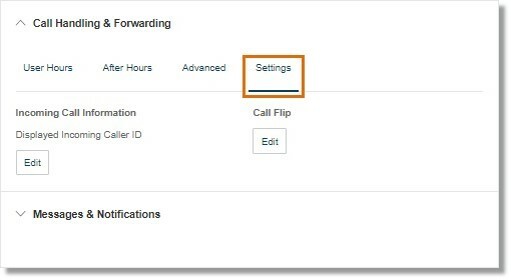 See Setting up the Call Handling and Forwarding to customize the Call Handling and Forwarding settings. Log in to your Office@Hand online account. After clicking on Call Handling and Forwarding, select the tab that you want to configure. Decide how you want your calls answered during User Hours. Forwarding, once you add forwarding numbers, these numbers will ring one at a time, in order of priority. Simultaneously – For Call Forwarding, once you add forwarding numbers for Home, Mobile, and Work numbers, you can set these numbers to ring at the same time by choosing Simultaneously. For more information, see Office@Hand: [ADMIN] Adding a Forwarding Number to an Extension. Create Ring Group – Use this feature to group numbers and allow them to ring at the same time. Check the box beside the numbers you want to select and click Create Ring Group. Click Ungroup to ungroup the numbers. Add Call Forwarding Phone – Click this button to add another phone number. Forward to Other’s Phones – Click the kebab button beside Add Call Forwarding Phone to open this option and select from a list of other user’s numbers. Call Forward for Unreachable Phone – This option when enabled will allow calls to be forwarded when the user extension phone is unreachable. Please Note if you have call forwarding to any PSTN number this option will not be usable. Decide how you want your calls answered during After Hours. Note: If you want to configure your User and After Hours schedule, go to Office@Hand: Setting the Hours of Operation. Select if you want calls to go directly to your voicemail. Select if you want to play a recorded greeting, then immediately hang up. Select if you want to forward the call to multiple phone numbers in a specific order and have your greeting settings apply. Select if you want to forward the call to a different phone number without having to go through your greeting settings. This option is good when you want the call to go directly to your personal voicemail when you don’t pick-up. 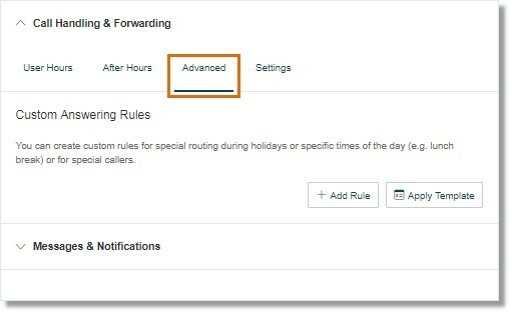 You can create custom rules for special routing during holidays or specific times of the day (e.g. lunch break) or for special callers. Add Rule – Click button to add a custom answering rule. Apply Template – Click button to open a list of your templates. Changes from a selected template will be reflected in the user’s overall settings. You can configure your Incoming Call Information and Call Flip settings. 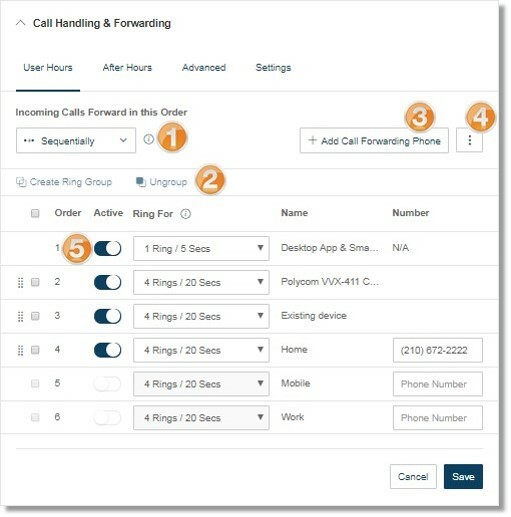 See Office@Hand: Using the Call Flip Feature and Office@Hand: Editing an Extension’s Call Information via Web, to learn more.